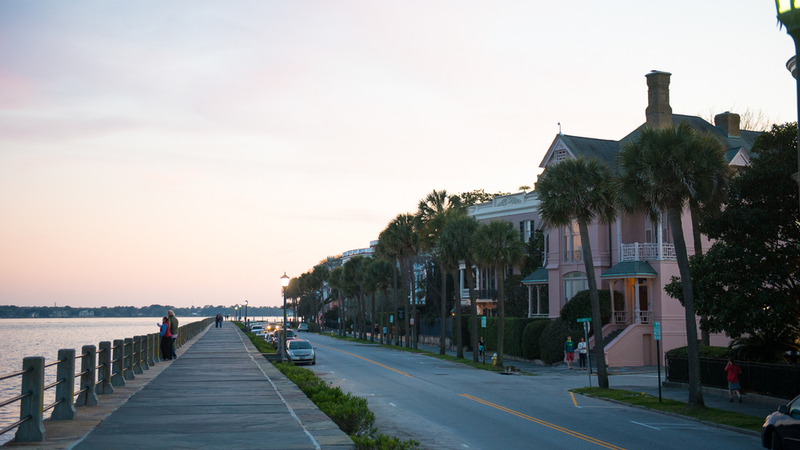 Horse-drawn carriages; Antebellum mansions; and grocery stores named Piggly Wiggly; Charleston excels at charming. Here is your 24-hour guide to keep you satiated from dawn to dusk to late night in the downtown area. John Rutledge built this elegant home as a wedding gift for his bride Elizabeth Grimke in 1763. In the 2nd floor drawing room, John Rutledge wrote several iterations of the US Constitution. Visit Waterfront Park to see this local landmark. Historic homes along East Bay. Greg Johnsman grows his own heirloom seeds and grinds them with the antique machinery. 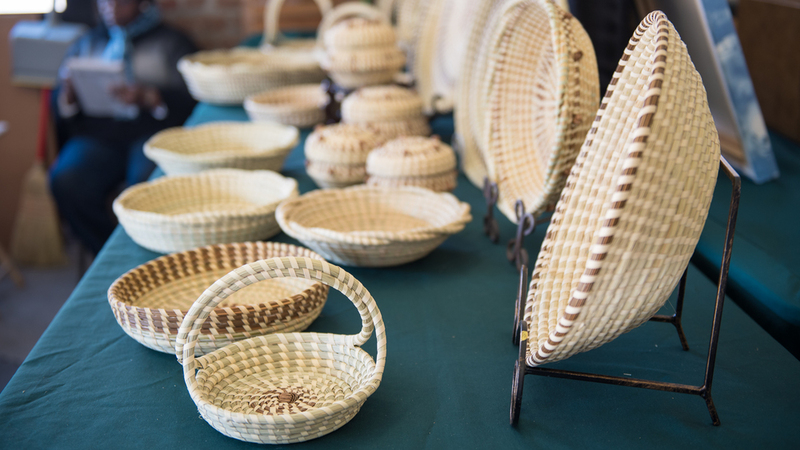 Made in Charleston from indigenous bulrush, these hand-woven baskets are one of the oldest handcrafts of African origin in the United States. Downtown mural featuring local celeb chefs. Walk to the right of Husk and down the path towards to back to find Husk Bar. Stop in for ham and bourbon. Don't be surprised to see a line here, especially for brunch. Chef Robert Stehling has made a name for himself cooking Southern classics. You'll feel like you've stepped back in time when you come to this small, American-style bakery. Get the chocolate chip cookies. Walk along the waterfront for sunset views and to work off the day's meals. When the sun sinks and the sky becomes magical colors, it's time to explore the many bars for cocktail hour. "I was never a fan of biscuits, until now. They are great, fresh, and buttery." Housed in a building built in the 1800s, that was originally named Brown's Court, they sell coffee, fresh baked bread, pastries and specialty confections. "The owner, David, bakes a really incredible consistent product. His baguette is the best in town." Serving espresso drinks, including pour-over coffee, macchiato, cortado, lattes, and Japanese Style iced coffee. "For their cappuccino. The Counter Culture coffee they roast always manages to be rich and robust with the most wonderful chocolate tones that keep me coming back." "I really like their cold brew iced coffee, it's not too strong or really bitter, just nice and mellow. You don’t get that jittery feeling when you drink too much of it." Shrimp & Grits at Marina Variety Store | Photo Credit: Find. Eat. Drink. Where boat captains and locals gather for breakfast and have been since 1963. "Great for breakfast. It overlooks the harbor with all the boats and you can see the sun rise in a beautiful setting. It’s fabulous. I like to get an omelet, it could be Greek-style shrimp, spinach or portobello. I get grits and French crispy toast, that’s buttered and griddled." "It's a great spot overlooking the Charleston marina and a solid joint to get the day moving with basic eggs always cooked perfectly. I love the staff and the coffee is bottomless and strong. A favorite spot for morning meetings or a mid-week breakfast journey." Farmers, food trucks and artisans. See what the lowcountry bounty has to offer and pick up a sandwich, coffee, juice or ice cream. "I love this farmers' market. It's the best place to get the real vibe of the city with local producers. You can get everything from vegetables to eggs to unpasteurized milk." "You can get coffee or a fresh squeezed lemonade, have a little breakfast, then you get your groceries for the week. My favorite vendors are Zachary Farms for nice produce and Roti Rolls for Indian sandwiches." Photograph Courtesy of goat. sheep. cow. Cheeses | goat. sheep. cow. "Their cheese selection is absolutely beautiful. Their setup is spot-on for a wine, cheese, and meat shop. I come here once a week for a cheese plate selection." "For the best cheese selection in the area - bar none. Ask for a taste because the source so much unique stuff that you can't find elsewhere." Southern specialities meant to taste like grandma's cooking - that is, if grandma had won a James Beard Best Chef Award like chef / owner Robert Stehling. "I send every visitor to Hominy Grill. Amidst all of the trends in dining, Robert Stehling has stuck to his guns and continues to produce the only truly Lowcountry restaurant." "For their shrimp and grits. Robert Stehling is doing great, updated Southern classics with a deep respect for tradition and technique. Weekend brunch is mobbed, there’s a nice outdoor terrace if the weather's good. Super-casual." A tiny, pink-painted soul food shack where you can dine in or take out. Martha Lou has been cooking lowcountry dishes for decades and the years have brought her a loyal following. "It’s a cinderblock building, tiny, only has about 5 or 6 booths, a home stove and one employee, Martha. You walk in, she greets you, asks you how your day is, how hungry you are, and what you want to drink. You feel like you’re sitting in her dining room at her house and she’s cooking for you." "If you are looking for fried chicken, because really, who isn't, Martha Lou's cannot be beat." Located in a renovated auto paint and body shop that was named Leon’s. 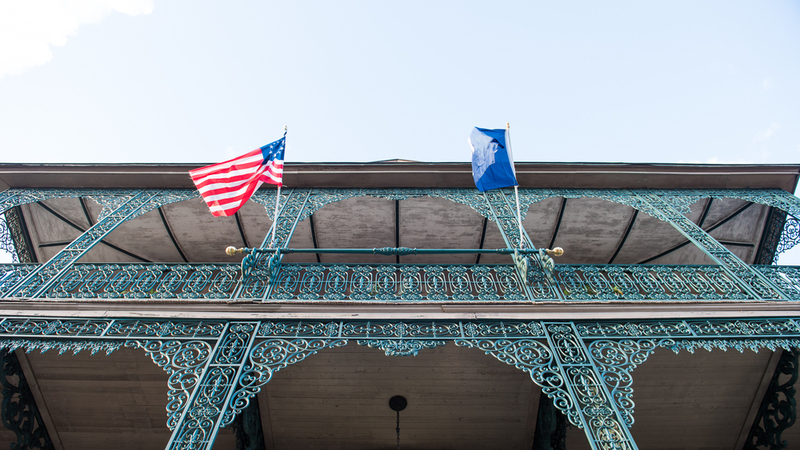 "Leon's brought chargrilled oysters, a New Orleans classic, to Charleston. The atmosphere is super cool and they have great cocktails, like the elderflower gin and tonic, and a fantastic wine list that pairs beautifully with seafood as well as their signature fried chicken. This is a spot where you can hang out all day long." Elevating the art of sandwich making using premium regional ingredients. Their menu changes daily and they're open late on the weekends. "I like to come here for their vegetable plate. It's a hidden gem of their already fun and ever changing menu." "In addition to lunch, they have a huge late night food game. They are always changing what they are doing and it's also bring your own beer. It’s fun to meet up with friends after work or when the bars are closing to finish off the night with some fun and food." Two New York City architects turned bakers are charming the South with their sweet cakes, cookies, tarts and pies. "Their caramel cake is probably the best one around. It’s a light layered cake with a caramel icing on it, really intense and sugary." "Small little petit fours, cupcakes and sweets. Their cookies are just phenomenal." "Their Sunday morning cinnamon rolls are legendary. But only available on Sunday mornings and there’s a line out the door. Fantastic! They’re just decadent, cinnamony, yeasty, warm, sticky and gooey - just fabulous." The oldest production micro-brewery in the state of South Carolina. "For their Espresso Porter, a rich espresso-type beer. They make it with Charleston Coffee Roasters, which is right outside of their backdoor." A family-owned local brewery using organic ingredients. Their beer styles change with the seasons. "They brew a beer called Bulls Bay Oyster Stout with local oysters." "They are very big into reducing their carbon footprint. These guys are kicking out amazing IPAs, great lagers and pilsners." "They have great attention to detail and it has never become mass produced." The Gin Joint | Photo Credit: Find. Eat. Drink. Owners Joe and MariElena Raya learned the ropes at The Culinary Institute of America, Blackberry Farm, The Four Seasons Palm Beach, The Breakers Hotel, and Robert’s of Charleston before opening their speakeasy cocktail lounge. "I’ve never had better cocktails anywhere. They’ve got great palates since they are chefs and they look at cocktails like dishes and you taste that and it’s just so good." "Having a cocktail here is like eating a dish that a chef has created. They do snacks like soft pretzels and a fish stick dish with fish mousse and tarragon cream. It’s so simple, but it’s really good." Barrel-Aged Manhattan & Broadbent Country Ham | Photo Credit: Find. Eat. Drink. "For the bourbon lover this is where you come to. They probably have anywhere between 70 to 90 bourbons depending on the time of year and what’s available. Some are a limited release and aren’t available all the time. The bar is in a separate building from the restaurant, so you can’t have dinner here. But they have lighters apps like Benton's ham." This spot covers all the bases. You can enjoy all-day breakfast and hearty American fare like Chicken and Waffles, Country Fried Steak and a daily Blue Plate Special, but also craft cocktails, house-made sodas, beer, and wine. "For their masterfully prepared variations on classic cocktails, including their stellar version of the Greyhound and Moscow Mule, which has me drinking vodka again in a serious way." From James Beard Award-winning chef Mike Lata, this Upper King District seafood house takes advantage of Charleston's coastal waters with a raw bar featuring local oysters, regional fish and shellfish. "It’s a beautiful space with impeccable service. The skate wing terrine is not only incredibly tasty, but innovative. Chef Lata has this ability to take a very recognizable ingredient and present it to you in a way that you’ve never thought of before." "Champagne and caviar service at The Ordinary is an absolute must! It's an experience that feels very grown up and special, but does not break the bank." Xiao Bao Biscuit | Photo Credit: Find. Eat. Drink. Okonomiyaki at Xiao Bao Biscuit | Photo Credit: Find. Eat. Drink. Asian Soul Food with dishes from China, Korea, Japan, Taiwan, Thailand and Vietnam. Menu changes seasonally with rotating daily specials. "It’s really different than anything else in Charleston. After slinging bacon all day, I just want something vegetable and something that doesn’t look like Southern food. I like to get the cabbage pancake (Okonomiyaki) with shredded cabbage and carrots. They char it nicely in the bottom of the pan and send it out to you really hot." "They do Asian comfort food, things that you wouldn’t typically see in a Japanese or Chinese restaurant, but things that you eat at a Chinese grandmother’s house. Their mapo tofu is really good. They do a Japanese pancake called Okonomiyaki, and it's taking the the town by storm." "They are thinking outside of the box. It’s an old gas station that’s been converted and they're serving Asian soul food. The Okonomiyaki is like the world's best hashbrowns." Pickled Shrimp & Root Baking Co. Rye Bread at Edmund's Oast | Photo Credit: Find. Eat. Drink. "The beer selection is wonderfully curated and never boring. The shrimp toast and ricotta toast are among my favorites." "They have forty-eight beers on tap, some of which they brew themselves. Their wine list is also great. Put simply, if you can't find something you like to drink here, you need to take a good hard look at yourself." Margaritas, tequila flights and a large Mexican street food menu. "For guacamole and frozen screwdrivers." Craft cocktails, upscale scotches, bourbons, eclectic beer and wine. They offer cheeses, meats and sandwiches to go with your imbibing. "They also have home-made pop tarts." "End the night with a neat whiskey here. They also have the best soda water in town." "It has a speakeasy vibe to it and they are always creating new and interesting cocktails. They also have a nice beer selection and they offer small meat and cheese boards. There is always a movie playing on a projector screen -- something from days past that really sets the interesting mood they are going for." "They definitely have the classics down, Old Fashioneds and Martinis are good here. Get here early as it's sitting room only and they fill up quickly. They also have a solid whiskey selection to choose from." It's a little pub with a big moose head mounted on the wall and a good beer list with craft, can, bottled and draft picks. Mike's Famous Duck Club is a triple decker sandwich with duck confit, apple-smoked bacon, and smoked cheddar on sweet Hawaiian bread. "They have the pinnacle of bar fare with wings and all kinds of crunchy, salty snacks. Their Duck Club is unbelievable. It's awesome. They serve late, so it's a good chef hangout. Good beers too." "A great beer selection, great food, and the Duck Club is a wonderful sandwich." Think beer bar with pub grub American food. But here they offer an eclectic draught beer selection with forty-two taps of unusual, rare and one-of-a-kind beers from South Carolina and beyond. "I come here late for a beer." "They have 42 beers on tap, cool bar food, and a swag atmosphere"
"Amazing selection of craft beers on draft and daily beer flight options. The overall ambiance is loaded with squirrel and other small critter taxidermy, old signs, some strangers in framed family photos, just eye candy for days. Think more upscale pub food with a focus on locally-sourced ingredients and flavors." Take home beer from the oldest production micro-brewery in the state of South Carolina. They make a variety of pale and dark ales with year round flavors, as well as limited seasonal flavors. Locally-made in Charleston, Jack Rudy's products will dress up your cocktail cart from artisan tonics to small batch grenadine to Bourbon Cocktail Cherries. 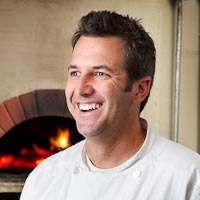 Recommended by chef Josh Keeler, Greg Johnsman grows his own heirloom seeds and grinds them with the antique machinery. You can find his grits in many area restaurants and you can buy them either online or at the general store on his farm. 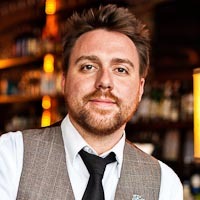 Executive chef of Husk, McCrady's, Minero in Charleston, SC and Husk in Nashville, TN. 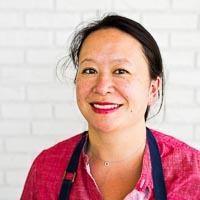 Executive chef and co-owner of FIG, The Ordinary in Charleston, SC. 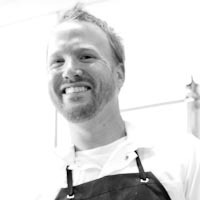 Executive chef and owner of Hominy Grill in Charleston, SC. Executive chef of Wild Olive, The Obstinate Daughter in Charleston, SC. Chef and co-owner of Carter's Kitchen in Charleston, SC. Executive chef of Cypress in Charleston, SC. Chef and owner of The Grocery in Charleston, SC. 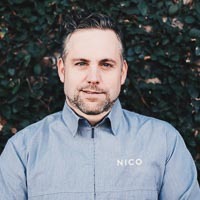 Executive chef of Nico in Charleston, SC. Bartender and restaurateur of Leon's Oyster Shop, Little Jack's & Jack Rudy Cocktail Co in Charleston, SC. Bartender, formerly of The Cocktail Club in Charleston, SC. Cookbook authors and owners of Lee Brothers Boiled Peanut Catalogue in Charleston, SC. Bartender and bar manager at Prohibition in Charleston, SC. Exectuve chef at 492 in Charleston, SC. Head Bartender at 492 in Charleston, SC. Head Bartender at Harold's Cabin in Charleston, SC. 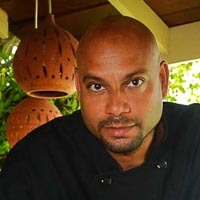 Executive chef of Cane Rhum Bar & Caribbean Kitchen in Charleston, SC. Executive chef of Indaco in Charleston, SC. Pastry chef at Butcher & Bee in Charleston, SC.